She plays regularly as a soloist and chamber musician, including recent engagements at the Albert Hall’s Elgar Room, St James’s Church Piccadilly, Cadogan Hall, West Road Concert Hall in Cambridge and Moscow’s Myaskovsky Hall. 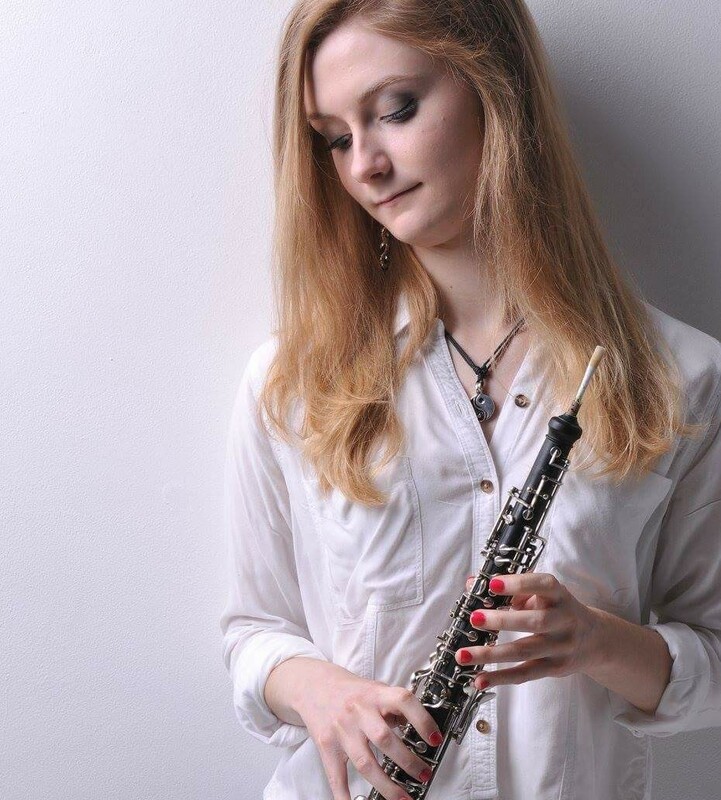 Polly Bartlett (19) is a first year undergraduate oboe scholar, supported by a John Nickson and Simon Rew award, at the Royal College of Music, studying with Olivier Stankiewicz (London Symphony Orchestra) and Gareth Hulse (London Sinfonietta). She has benefitted from an extremely busy first year at the RCM, having performed in a masterclass with the renowned French oboist Jacque Tys, appearing as principal oboe with the RCM Philharmonic Orchestra in a performance of Beethoven’s ‘Eroica’ Symphony, and also as soloist in Joseph Horovitz’s ‘Oboe Sonatina’ as part of the composer’s 90th birthday celebration concert. She has recently been appointed as Principal Oboe of the St. Endellion Easter Festival Orchestra and will be appearing at Cadogan Hall, London, in June with the RCM Wind Quintet as part of the College’s ‘Rising Stars’ series. As well as playing the oboe Polly is a keen recorder player. At the age of 11 she was awarded the Trinity College London Exhibition Award after attaining the highest grade eight distinction in the UK for any instrument throughout 2009 and in the same year was a winner in The Two Moors Festival Young Musicians Platform competition, run in association with Classic FM. In 2012 she achieved her ATCL diploma with distinction aged just 14 and in March last year was a woodwind finalist in the BBC Young Musician 2016 with her performances being broadcast on both BBC Radio 3 and BBC 4 television. Clarinetist Jorge Ripoll began his musical studies at the age of eight at the Conservatory of Alicante, winning an honorable mention in 2011 before entering the Conservatory of Music of Aragon. He was a member of Alicante Youth Orchestra and the National Youth Orchestra of Spain in 2014. He has been principal clarinet of The World Orchestra since 2015 and with them has toured Lebanon to play at the Al-Bustan festival and worked with composer Michael Nyman on his new recording. He also has been selected to take part in the Schleswig-Holstein Musik Festival Orchestra and the Chamber Orchestra of Europe Academy in 2017. Jorge Ripoll is a winner of numerous awards, including first prize in the Young Performers Competition in Alicante in 2005 and the third prize in the XVIII Young Performers Competition in Villena in 2006. In both 2012 and 2014 he won the 1st and 3rd Clarinet Quartet Competition “clarinetissim” in Valencia, Spain with his cuartet Romero. Other collaborative projects include his Trio Arniches of which he is a member and founder. The group have played in concert halls across Spain including the Palau de la Música in Barcelona, Auditorio Nacional in Madrid and the Fundación Juan March. For two years, he has been trying to bring classical music through dance to other audiences with the dancer David Fabra. His adaptation of Debussy’s Rhapsody for Clarinet and Piano premiered in Zaragoza to great success and they are now working on new projects. Jorge is currently pursuing his Masters of Performance at the Royal College of Music as an RCM Scholar supported by a Wilkins-Mackerras Award. Matthew Horn is a French horn player who studied for his Master of Music at the Royal College of Music as a Derek Butler Scholar and a Help Musicians UK Postgraduate Award Holder, with Simon Rayner, Jeff Bryant and Tim Jones. Matthew completed his Bachelor of Music at the Guildhall School as the James Anthony Horne Award Holder, where he studied with David Pyatt, Jonathan Lipton and Alec Frank-Gemmill. Matthew has played in the Philharmonia Orchestra conducted by Ed Gardner and was the only British member of the Verbier Festival Orchestra 2016 in Switzerland, where he has been conducted by Ivan Fischer and Michael Tilson Thomas. In June 2016, he doubled first horn in a side-by-side performance of Berlioz Symphonie Fantastique with the London Symphony Orchestra and Guildhall Musicians directed by Sir Simon Rattle. Matthew performed Anthony Payne’s Horn Trio, live on BBC Radio 3, at the BBC Proms Extra Event, Composers in Conversation, in July 2016, which led to being invited to the British Horn Society Festival 2016 as a solo artist. Other recent solo performances include Britten’s Canticle III in the Barbican Hall in April 2016, and a wind quintet recital in Wigmore Hall in March 2017. Matthew has recorded in Abbey Road with Pink Floyd on their album: “Wish You Were Here Symphonic”. While completing his bachelor’s degree at the Sydney Conservatorium of Music, Australian-born Justin Sun participated in the Sydney Symphony’s Sinfonia and Fellowship programmes. He was the principal bassoon of the Australian Youth Orchestra and has performed as guest principal with the Sydney Symphony and the Australian Opera and Ballet Orchestra. In September 2016 he moved to London to begin postgraduate study at the RCM as a Mike Rimmer Scholar, and shortly after his arrival was named the Nora Goodridge Emerging Artist of 2016 by the Australian Music Foundation. In early 2017 Justin competed in the annual Royal Overseas League Competition and was awarded both the Sussex Prize for Best Woodwind Performance, and the Tait Memorial Scholarship for an Outstanding Australian Musician.